"Just like the stars, the brightest ones are the most fleeting and collapse into the deepest, darkest black holes," says the unnamed hero of "Brightest Star" at the movie's onset. The faux-profundity of the observation is a trifle undercut by the fact that we aren't sure what the object of the comparison is. I suppose we are meant to assume it is the beautiful young woman with blonde hair seen in several sunlit shots, the views of her smile accompanied by an insistent wimpy guitar-or-piano chord and some tinkling glockenspiel, or high school band xylophone, or vibes, I don't know. Lack of specificity in the writing aside, the opening of "Brightest Star"—which had its title changed, to no avail, from "Light Years"—tells the viewer loud and clear that this trek is not going to lead anyplace new. The unnamed protagonist (Chris Lowell) awakes from an emotional hangover with his hair nevertheless perfect, and unburdens himself to the free-and-easy young couple that are taking possession of the apartment that little-miss-bright-star (this character actually gets a name, Charlotte, and is played by Rose McGiver) and he once shared. We are given to understand that this is a boy-loses-girl narrative, and Boy utters all of the drippy commonplaces that signal that he is a Fellow Of Tender Feeling who is on his way to Learning A Valuable Lesson About Life And Love And Himself. "When she showed up I felt like I knew where I was supposed to go—to her," he mutters in hushed awe. "It was magic. She made me feel…right." I'm digging you, buddy. Remember that Van Halen song, "When It's Love?" Man, Sammy Hagar called it. Right? No? No, maybe not, because during the movie's obligatory montage of he's-going-that-way/she's-going-this-way cohabitative discontent, the music is something called "Can't Let Go," a dribbly electronic quasi-funk number from one Christopher Norman, which plays out in its (seeming) entirety. That's one way to kill time in an 80-minute-movie that has a narrative more suited to a twenty-minute one that would have been better off not having been made at all. This is a movie that so privileges the perspective of the good-looking foofy-haired white male that it makes you understand the absolutely pejorative aspect of the term "heteronormative." Oddly enough, though, the movie was directed and co-written by a woman, Maggie Kiley (who's also an actress, although she doesn't appear in the picture). After the unnamed fella drops his phony yuppie job and gets a gig working as a janitor in an observatory (longish story, and again, not very interesting), the movie touches on an almost interesting idea. After asking an astronomer played by Allison Janney to show him something that happened four years ago (because of light years, get it, and stars and stuff, and, yes, four years ago was when he and Iris…you know), she asks him what he's doing there. He replies, "I thought I'd find my calling…I had this fantasy that being here would ignite some part of my brain I didn't know about, and that suddenly, without any mathematical or scientific skill, some astronomical superhero would emerge, like it was always meant to be if I just had the guts to give it a try." This not uncommon delusion could fuel a good movie someday. It arrives too late to save this one, not that it necessarily could have. Watching "Brightest Star," I thought of the Pere Ubu song "Ice Cream Truck," in which David Thomas sings "There's too much music in the land, you hear it everywhere." I also thought of New York Times film critic Manohla Dargis' much-taken-to-task recent observations concerning movie glut. 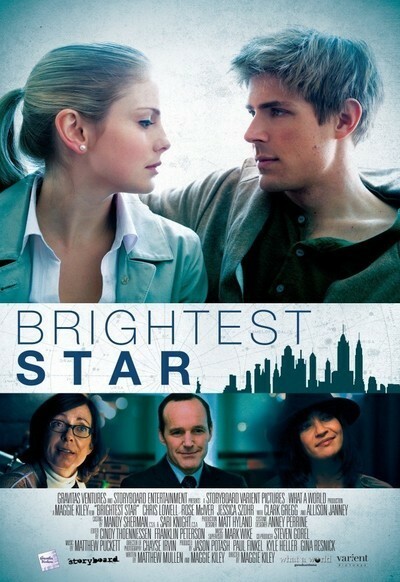 This review is not the proper vehicle in which to expand upon these thoughts, but if and when I do, "Brightest Star" would not be an inapt Exhibit A.